Please join us for a fun and informative open evening on the traditional arts and crafts. The evening will begin with a warm introduction from our Director of Education, Paul Marchant followed by short presentations from students and alumni. There will be lots of opportunities to ask questions and meet representatives of the School. Posters showing various elements of the School’s work will be exhibited and leaflets and brochures will be available to take away. Light refreshments will be provided. All are welcome and entrance is free but pre-registration is required as spaces are limited! Many of the world’s sacred traditions and traditional art forms have already been destroyed. 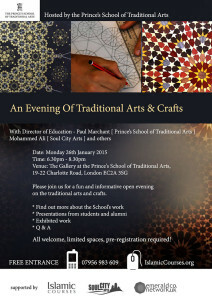 The Prince’s School of Traditional Arts was founded in 2004 by His Royal Highness The Prince of Wales to work on a practical solution to reduce the threat of further extinction. [Soul City Arts] The Art of Mohammed Ali has been taken across the globe and described as challenging the oft-heard term ‘clash of civilisations.’ with his fusion of street-art and islamic script, along with his conscious messages. It was after his new-found passion and rediscovery of his faith in Islam, that he began to fuse his graffiti-art with the grace and eloquence of sacred and Islamic script and patterns. He describes his work as, ‘taking the best of both worlds.’ and bringing back to the forefront principles that are gradually fading away from our modern societies. Mohammed Ali was drawn to the graffiti world from early 80’s inspired by the subway art movement, and like many kids living in the UK was involved with the street-painting scene. After studying Multimedia Design at university, he went onto working in the computer-games industry as a designer. Soon enough he became disillusioned with using his creative skills for commercial benefit and creating art for art’s sake, and began exploring with creating art for ‘mankind’s sake’. Graffiti was often a self-glorification of one’s identity, the ‘tag’ being the focus. Mohammed began exploring simple messages which at the heart of were still – the words – but words which pointed to other than the ‘self’, with a deeper message, that was speaking to the public, and relevant to the wider society.